Version 5.3.6 of Default Folder X delivers fixes for a few problems that have cropped since the last release. The most significant is a bug that caused the mouse cursor to disappear when using an Open or Save dialog, resulting in things appearing “stuck”. This occurred if you were using SteerMouse or any other utility that modified mouse behavior on the fly. A change that I made in 5.3.5 also resulted in Default Folder X’s Finder-click feature being disabled if there was a Keyboard Maestro floating palette showing anywhere on-screen. That’s now fixed in 5.3.6 – my apologies to all of you joint Default Folder X / Keyboard Maestro users out there! This release also includes a number of bug fixes for crashes, startup hangs, user interface issues, and a problem with the Finder-click feature not switching its list of Finder windows when you switch Spaces. You can see the release notes and grab the latest version from the Default Folder X Release Page, or by choosing “Check for Updates” from Default Folder X’s menu if you’re running it now. While there isn’t a giant “marquee feature” in this release, version 5.3.5 of Default Folder X delivers a long list of improvements. In terms of new functionality, users of HoudahSpot (and those of you that don’t use it and should go try it now) will be happy to see that you can start a search directly from an Open or Save dialog. 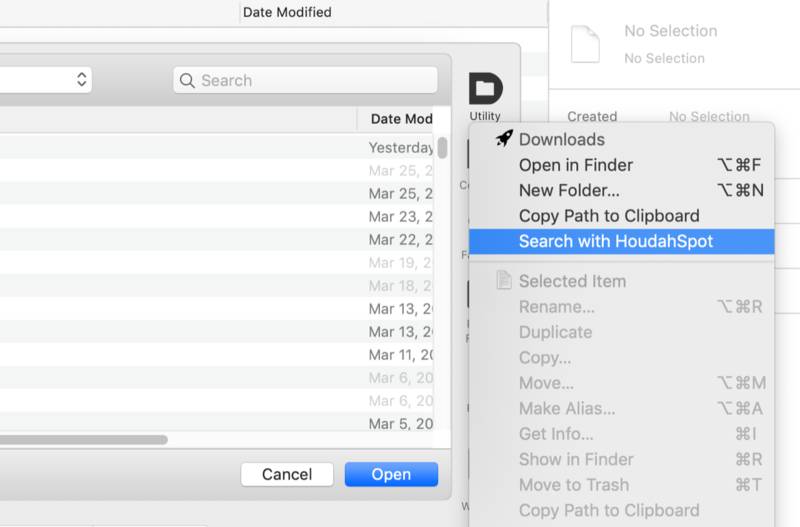 This helps overcome the weak search functionality that macOS offers by default in file dialogs. 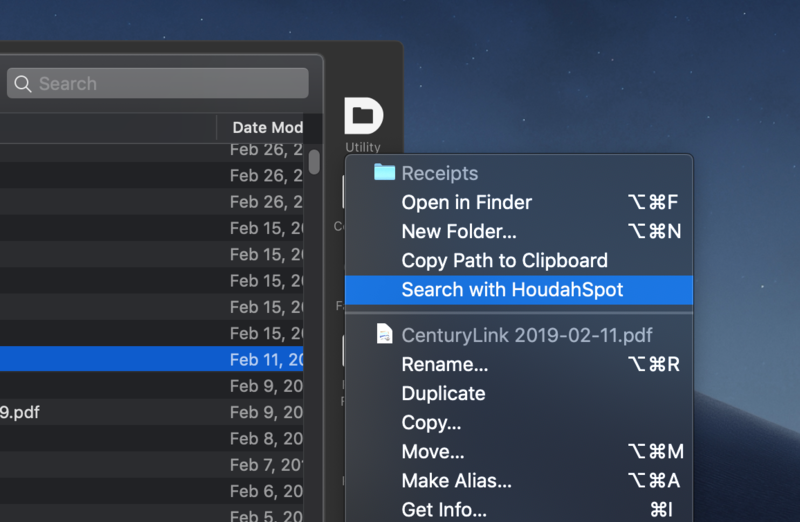 And with the upcoming release of HoudahSpot 5, you’ll be able to make “round-trip” searches, sending results back to the waiting file dialog after you’ve found what you want. Version 5.3.5 also offers a bunch of improvements for Default Folder X’s drawer in the Finder, fixes for bugs involving its selection of recent files and folders in Open and Save dialogs, a problem with file dialog sheets when they’re the full width of the screen, and issues with some many-button mice. Oh, and the secret settings dialog now lets you turn on “view-matching” for the Finder-click feature, making Default Folder X apply whatever view mode (Icon / List / Column) is used in the Finder window to the file dialog. And you can specify a minimum width and height for file dialogs, preventing them from coming up in a uselessly-small default size. Hold down the Option key while choosing Preferences from Default Folder X’s menu to get there. As usual, the change history and download links are available on the Default Folder X Release Page. Go get it! 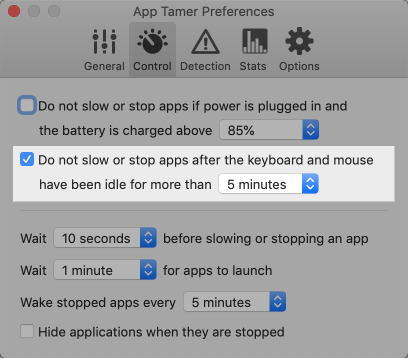 Version 2.4.3 of App Tamer is available, offering a new option to turn off its AutoStop feature when you’ve been away from your Mac for a specified period of time. This allows you to stop or slow down background processes so they don’t impact your work, but let them run at full speed when you’re not otherwise using your Mac. This release also corrects a number of issues, including several crashes that occur in exceptional circumstances and a bug that could prevent apps from returning to full speed when you click on their icons in the Dock. In addition, App Tamer’s ‘wake’ AppleScript command now supports waking up all stopped and slowed apps at once. For full details and download links, visit the App Tamer release page. So I learned an important lesson in user interface design: There are times when you DON’T want a consistent look and feel. The user-confusion resulting from my mistake in Default Folder X 5.3.3 necessitated the release of Default version 5.3.4 yesterday. First a little background: Due to the increased Privacy controls in Mojave, when you first launch it, Default Folder X has to lead you through several steps to give it permission to access necessary information and API’s. It does so by opening System Preferences and presenting a couple of dialogs that provide steps that you need to follow. Easy, right? These are the dialogs from version 5.3.3. So here are the fixed dialogs. Different overall look, different boldfaced heading, and different buttons. And an important lesson learned: People are busy, and are not necessarily giving your app 100% of their attention. Make sure that when the state changes, the change is noticeable to them. Especially when their only option if they don’t notice the change is to quit your app. Sooo – get Default Folder X 5.3.4. In addition to the updated Privacy prompts, it contains several bug fixes. You can get it from the Default Folder X release page, where you’ll also find release notes describing the changes. Version 5.3.3 of Default Folder X is now available! I’ve been resistant to adding labels to the icons in the toolbar, but have finally been convinced – the improved usability for some people (especially casual users) trumps the aesthetic “messiness” of having the text there. The icon names are now turned on by default, but you can easily turn them off in the prefs, or just by Control-clicking above the “D” icon and choosing “Icon Only”. This release also lets you set keyboard shortcuts to quickly hop to the Tags or Comments field below a Save dialog. 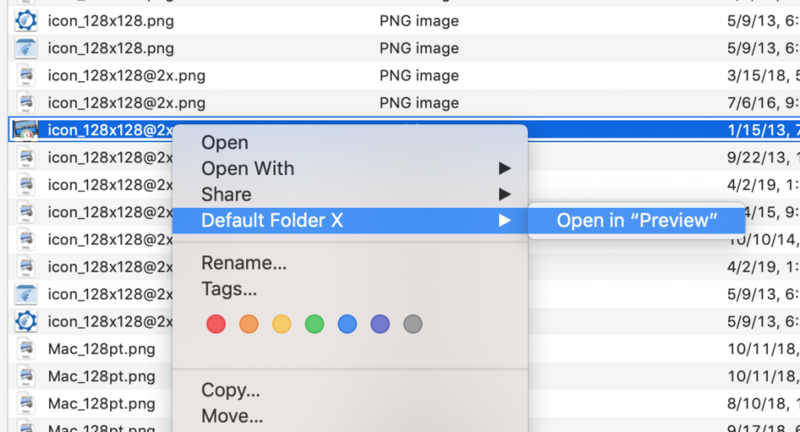 And if you hold down the Option key while clicking the “Save” button to dismiss a Save dialog, Default Folder X will automatically open the folder you just saved your file to, letting you do whatever you need to do with it in the Finder. There are also bug fixes to resolve several crashes that have been reported, tweaks to clean up the user interface in the Preferences window, and a compatibility fix so that the Finder Windows feature now works with the version of ForkLift distributed through the SetApp subscription service. Check out the Default Folder X release page for a complete list of changes, as well as download links. Or if you’re already a Default Folder X user, just choose “Check for Updates” from its menu in your menu bar. Version 2.4.2 of App Tamer is available! There’s an exclamation point there because it offers a fix for an annoying problem that cropped up in Mojave, where Core Graphics Event Taps no longer deliver events to applications when they’re in the background (Radar #45934966 if you’re listening, Apple). 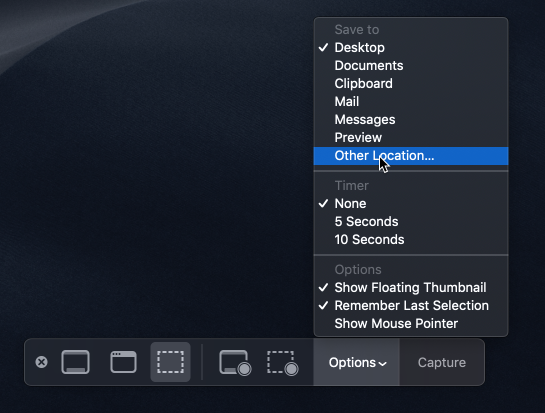 While that may sound cryptic, the end result was that App Tamer never saw mouse scrolling events when you used a scroll wheel or gesture to scroll the contents of a background window. If the background window belonged to an app that App Tamer had slowed or stopped, that meant that the window would scroll slowly or not at all. This drove me crazy ALL THE TIME because I apparently scroll through web pages and other background windows very frequently. 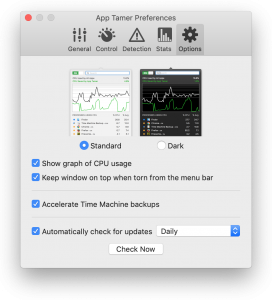 Anyway, in addition to that issue, this release improves the ability to move through App Tamer’s process list using the keyboard, and lets you keep App Tamer’s window floating on top of all other windows if want to use it to diagnose a problem or keep an eye on CPU-gobbling processes. A number of little interface issues have also been addressed, and a bug fixed for App Tamer waiting too long to slow or stop background processes when they were also set to be hidden after a certain amount of time. As usual, this update is free for users who’ve already purchased a license for App Tamer 2.x. You can head over to the App Tamer Release Page to see more details or to download the new version (or just hit “Check for Updates” in App Tamer’s utility menu if you’re already running it). HistoryHound 2.0 was released last month, shortly before Christmas, and I neglected to announce that here on the blog with all the holiday goings-on. 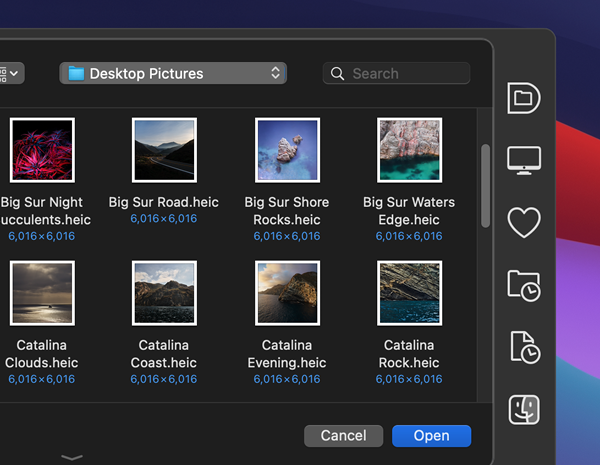 This update to our ‘personal web search’ tool adds support for the latest versions of your favorite browsers, as well as providing Mojave compatibility. In addition, version 2.0 makes HistoryHound smarter about fetching and indexing visited web pages. It won’t repeatedly try to load a page that returns an error, nor will it index “front door” pages where you’re being asked to log in to a secure site. Its error handling has also improved, eliminating a number of bugs and situations where you’d previously have gotten an error message or warning. Ronald combed through the French localization, providing a host of corrections and improvements to make the user experience more fluid for French-speaking users. And I modernized all the resources to bring everything up to date (though the main window does still use a drawer instead of a sidebar – that anachronistic interface element will be replaced in a future update). You can hop on over to the HistoryHound Release Page to see a full list of the changes, as well as to download a copy. The update is free if you’ve got a license for version 1.x, even though the major version number has changed. The extent of the internal modifications felt like they merited a “2.0” version number, but because there aren’t many changes on the outside, it didn’t seem fair to charge for the update.